helping horsemen support our supporters. The PHHA Political Action Fund was formed to raise voluntary contributions that will be used to support candidates for state elective offices who share the beliefs and concerns of our members. By supporting PHHA PAC you are playing an important role in protecting your business interests as well as contributing to the development of our sport. EDUCATING OUR ELECTED OFFICIALS ON THE VITAL IMPORTANCE OF RACING. It's not enough to merely support the right candidates. Our lobbying efforts extend to the ongoing education of elected officials regarding the positive, multi-million dollar economic impact of harness racing to Pennsylvania annually, as well as the many jobs it sustains and creates, and the outside investment dollars it attracts. join our efforts to protect your interests. Each and every year, horsemen face legislation that threatens your livelihood. We need your help to keep fighting for what's right. For more information and how to contribute, contact us at your earliest convenience. · The industry is responsible for creating and maintaining 20,000 jobs related in the breeding, raising, training, racing, riding, and care of racehorses. It provides economic benefit to the state’s general agricultural industry which supplies tack, hay, feed, and other products. · Secretary of Agriculture Russell Redding has offered testimony before the Pennsylvania Gaming Control Board that placed the value of the state’s racing industry at $1.6 billion. · Best of all, these benefits are realized without the use of tax dollars. The RHDF is NOT funded with state tax dollars and we challenge opponents to identify any statutory language that proves otherwise. The push is on in Harrisburg to expand gaming to taverns, fire halls, truck stops, airports and beyond. This would drive patrons--and slot machine revenue--away from racetracks and brick and mortar casinos, negatively impacting revenue and ultimately driving down racing purses as a result. Click here to learn more and find out how to take action by contacting your elected officials. On Thursday, October 23, news outlets began issuing reports with headlines like "PA Gov. Tom Wolf warns that horse racing may shut down amid budget stalemate." It is important to note that a similar situation unfolded in 2013 and our industry worked together to avoid a shutdown. It is also important to note that purses are not an issue; rather, it is a shortfall in the funding required for the functioning of the bureaucracy (commission, drug testing, etc.). Our government relations team and industry partners at the PA Equine Coalition are actively working with all stakeholders on both short and long-term solutions for this funding issue. Once again, the PA state budget is past deadline and legislators look to the Race Horse Development Fund as a possible means of closing shortfalls. The PHHA, along with our government relations team and industry partners at the PA Equine Coalition, will remain vigilant regarding any attacks on the fund and alert our members of any potentially harmful developments. Governor Wolf's tax reform plan would expand PA sales tax to cover dozens of new categories, including horses. According to the Pennsylvania Department of Revenue, "horses purchased in the commonwealth and delivered to an out of-state location and race horses" would be subject to taxation. We continue to monitor the progress of Governor Wolf's plan. 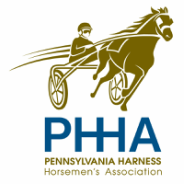 As with all pending legislative matters, the PHHA will oppose any plans that would be detrimental to the vitality of Pennsylvania racing. The horse racing industry is hopeful that our remarkable turnaround will continue under Governor Wolf. As a successful businessman, we believe he understands that the stability of the Race Horse Development Fund is a must if we are to continue attracting investment in Pennsylvania's equine industry and sustaining the jobs created by those investments. In the coming months, our coalition of stakeholders will continue our ongoing efforts to educate the entire legislature on the successes of Act 71, including nearly quadrupling the industry's value and tripling the number of jobs, as well as increasing handle on Pennsylvania racetracks. Members of the PA Equine Coalition are set to testify before the PA Senate Community, Economic and Recreational Committee (CERD) on the negative impact we believe proposed internet gaming will have on our industry. While we do not oppose internet gaming, a failure to put in place a properly structured framework will likely have an adverse effect on the racing industry, the $2.3 billion economic impact it has in Pennsylvania each year, and create an unforeseen ripple effect on other aspects of the state’s economy. Specifically, internet gaming legislation should not create a favorable tax structure that would incentivize casinos to encourage players to play online as opposed to on site. HB 1235 would establish a tax of 28 percent on daily Internet gaming gross revenue compared to the current rate of 55 percent on gross terminal revenue from slots. This creates a clear incentive to licensed gaming facilities to move players from in front of slot machines to sitting in front of their computer screens. This will result in loss of revenue to the state, as well as adversely impact the state’s racing industry. SB 1188 would transfer racing oversight from the current Commission structure to the Gaming Control Board, which has no experience whatsoever with our sport nor any special interest in promoting or developing it. A similar plan was enacted in Michigan with disastrous results, resulting in massive declines in race days and wagering. In addition, costs for race day testing would be passed on to horse owners. The PHHA and all members of the PA Equine Coalition are actively pushing for greater collaboration with legislators to help meet the Senate's goals of increasing transparency and modernizing racing-related laws without creating enormous potential damage to to the long-term health and stability of PA racing. Budget shortfalls are rampant in Pennsylvania. Over the winter, PA horsemen's organizations were suddenly informed that due to lack of funds for the state Racing Commission, operations would need to be shut down. Of course, without a Commission to oversee racetrack activities like licensing and enforcement, there would be no racing in 2014. The PHHA and other horsemen's groups worked together with legislators to divert approximately $4.2 million from the Race Horse Development Fund to keep the Commission up and running and save the 2014 racing season through mid-year. We will continue to work with stakeholders to develop a sustainable funding source for the Commission that does not negatively impact the RHDF. Each year, legislators facing funding shortfalls attack the Race Horse Development Fund as a potential source of closing budget gaps. We've already seen one such plan (below) that was introduced which would effectively end PA racing instantly upon passage, Luckily, that plan has been withdrawn -- for now. Until the PA state budget is settled this summer, we expect the attacks to continue. That's why we need your help to continue educating legislators on the facts and benefits of the RHDF. A state representative plans to introduce legislation that would divert $250 million from the RHDF to other projects. 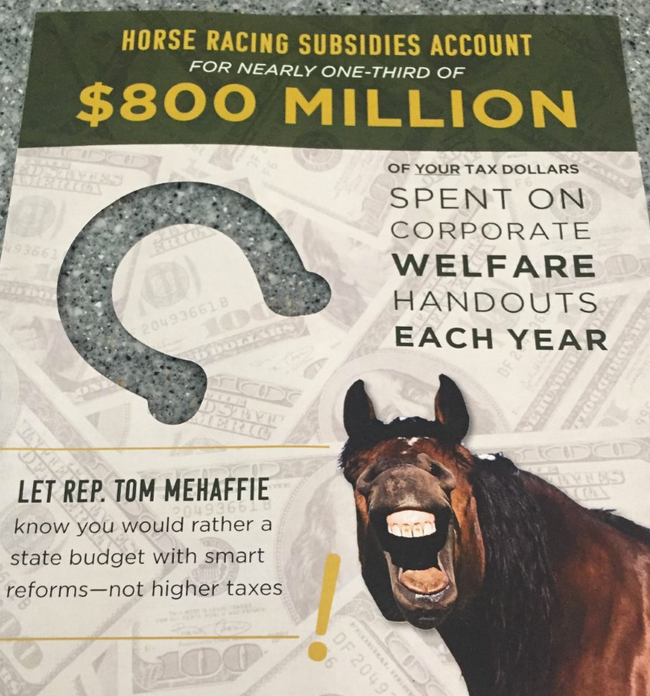 Since it is estimated that the fund will not reach $250 million in 2014, it would essentially end PA racing overnight, instantly killing tens of thousands of jobs and driving millions of dollars in positive economic impact (and much-needed tax revenues) to neighboring states. The news media has so far been supportive of the effort; see links below. While we feel the proposed legislation will not gain traction, the mere fact that it was introduced shows how important it is to continue educating legislators on the facts and benefits of the RHDF. Forbes magazine article: "Pennsylvania's Casino Taxes: Betting On Horses Or Children?" Philly.com article: "Pa. lawmaker proposes using horse racing funds for schools"
Philly.com article: "Gift horses: Slots players send $1.5 billion bouquet to Pa.'s race industry"
PHHA staff and lobbyists, in concert with other members of the Pennsylvania Equine Coalition, are pleased to report that a provision of state code that resulted in the diversion of 17 percent -- more than $200 million over the last four years -- from the Race Horse Development Fund has sunset with the adoption of the state budget for the 2013-2014 fiscal year. Additionally, a budget proposal to divert approximately $31 million this year from the Race Horse Development Fund (RHDF) was also partially turned back, with the final diversion reduced to $17.6 million. To accomplish this, we engaged in an aggressive educational campaign throughout the budget process, talking with legislators about the negative impact that diverting more than $31 million would have on the state’s racing and breeding industries, the economy, and jobs. However, the annual uncertainty surrounding the RHDF continues to have a chilling effect on the state’s breeding and horse racing industry because of the lack of stability for the fund. We will continue to work to stabilize the fund so that businesses can have the confidence to proceed with investments in Pennsylvania despite challenging economic circumstances. We need your help to continue fighting these diversions, which we expect to be ongoing due to anticipated budget gaps in coming years. Proposed legislation would legalize internet gaming. The current proposed tax rates would incentivize online play versus gaming at a casino or racino. Since online play will not contribute to the PA Race Horse Development Fund, a shift in revenues to online play could devastate the horse racing industry and result in massive reductions in purses. We need your help to fight the proposed legislation and revise it so that horsemen will receive their fair share of all revenues.